The ball of your foot is the bottom part just behind your toes. Bands of tissue (ligaments) connect the bones in the ball of your foot. Nerves run between the bones and underneath the ligaments. When a nerve becomes pinched, this causes it to swell and become painful. The painful, swollen nerve is called a neuroma. 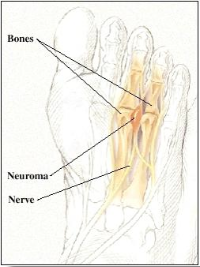 A neuroma most often occurs at the base of either the third and fourth toes or the second and third toes. Wearing tight or high-heeled shoes can cause a neuroma. Shoes that are too narrow or too pointed squeeze the bones in the ball of the foot. Shoes with high heels put extra pressure on the ends of the bones. When the bones are squeezed together, they pinch the nerve that runs between them. The most common symptom of a neuroma is pain in the ball of the foot between two toes. The pain may be dull or sharp. It may feel as if you have a stone in your shoe. You may also have tingling or numbness in one or both of the toes. Symptoms may occur after you have been walking or standing for a while. Taking off your shoes and rubbing the ball of your foot may relieve the pain. To prevent a future neuroma, buy shoes with plenty of room across the ball of the foot and in the toes. This keeps the bones from being squeezed together. Wearing low-heeled shoes also puts less pressure on the bones and nerves in the ball of the foot. The diagnosis of Neuromas is made by a physical exam and a thorough history of the patient’s complaint. Conditions that mimic the pain associated with Neuromas are stress fracture of the metatarsals, inflammation of the tendons in the bottom of the toes, arthritis of the joint between the metatarsal bone and the toe, or nerve compression or nerve damage further up on the foot, ankle, knee, hip, or back. X-rays are generally taken to rule out a possible stress fracture or arthritis. Because nerve tissue is not seen on an x-ray, the x-ray will not show the neuroma. A skilled foot specialist will be able to actually feel the neuroma on his exam of the foot. Special studies such as MRI, CT Scan, and nerve conduction studies have little value in the diagnosis of a neuroma. Additionally, these studies can be very expensive and generally the results do not alter the doctor’s treatment plan. If the doctor on exam cannot feel the neuroma, and if the patient’s symptoms are not what is commonly seen, then nerve compression at another level should be suspected. In this instance, one area to be examined is the ankle. How can I get my achilles tendon to heal? When is it safe to get a cortisone injection?